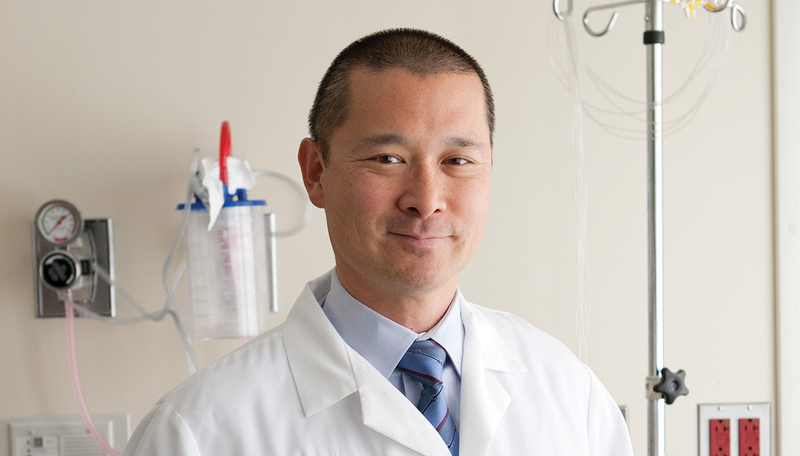 William Chey, M.D., the Timothy T. Nostrant, M.D., Collegiate Professor of Gastroenterology, and professor of internal medicine and of nutritional sciences, began his career at U-M in 1993. As head of the GI Physiology Laboratory, which completed about 200 procedures per year when he arrived, Chey — and GI technical director and research area specialist Jason Baker — expects the lab to conduct nearly 8,000 procedures in 2016. Chey credits that growth to the team he’s developed. Working with Dee Fenner, M.D., the Harold A. Furlong Professor of Women’s Health, and professor of obstetrics and gynecology and of urology, Chey also used a team-based approach to create the Michigan Bowel Control Program, or MBCP, one of the largest multi-disciplinary pelvic floor groups in the U.S.
Chey also leads a clinical research team, which conducted the first randomized clinical trial evaluating the low-FODMAP diet for patients with IBS in the U.S. The low-FODMAP diet eliminates certain carbohydrates that are difficult for the intestines to digest and absorb. Study results were promising, with more than 50 percent of the patients on the low-FODMAP diet reporting major improvement of their abdominal pain, compared with 20 percent of the control group. Chey’s team has just released a website to help patients to better understand the low-FODMAP diet.